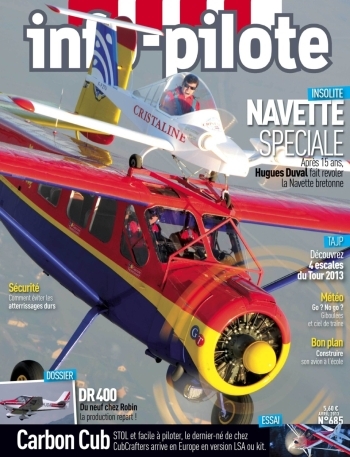 The April, 2013 issue of Info.Pilote magazine, a French publication, features the air-show pairing of the electric Cri-Cri E-Cristaline, powered by two Electravia GMPE 104 motors and riding atop a Broussard – what the DeHavilland Beaver might look like if it had been built in France. The great photos by Jean-Marie Urlacher are supplemented by a dynamic video showing a typical airshow lofting and separation – something that happens quickly even in slow motion. Info.Pilote has an informative table comparing the Navette Brettone (Brittany Shuttle), named for the sponsoring ferry boat operation, with the Navette Spatial, our space shuttle/Boeing 747-100 combo. While the big Boeing spans 196 feet, the Broussard is a relatively petite 45 feet. The Space Shuttle riding on the 747 is a substantial 78 feet, while the tiny Cri-Cri is a mere 16 feet across. The different airplanes’ relative weights are even more revealing. The 708,400 pound Boeing carries a 286,000 load: the 5,940 pound Broussard lofts a 447 pound twin-motored feather. This is the same Cri-Cri that set a world speed record of 175 mph at the Paris Air Show two summers back, by the way. Thanks to Anne Lavrand on her Electravia company blog for sharing this beautiful article. 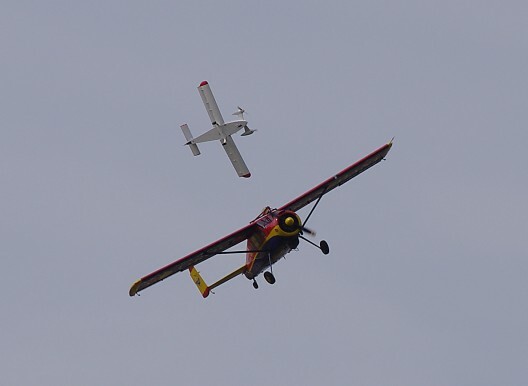 The dual aircraft crowd pleasers will be touring French air shows all summer. Modelers seem to be drawn to the largest and smallest in scale, something the Navette Brettone displays with great style. 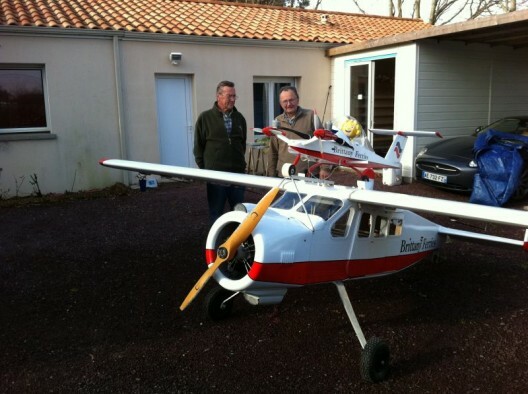 Philippe Peultier built a substantial 400-cc powered Broussard and a twin-brushless-motor-motivated Cri-Cri to share with the modeling fraternity. In either full or 5:30 scale, the Shuttle is an aerial dynamic duo and makes at least one of us eager to warm up his passport.